Cold, rainy. 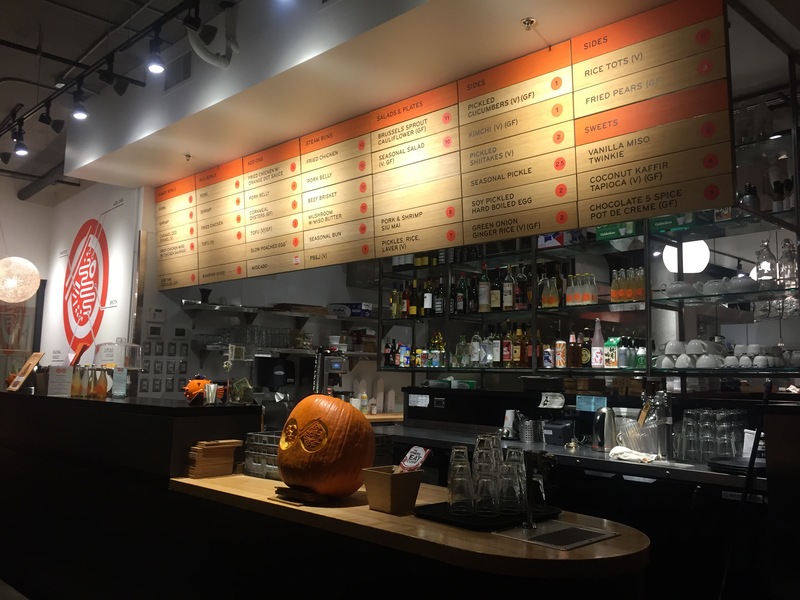 Perfect night for ramen in Portland’s Boke Bowl. 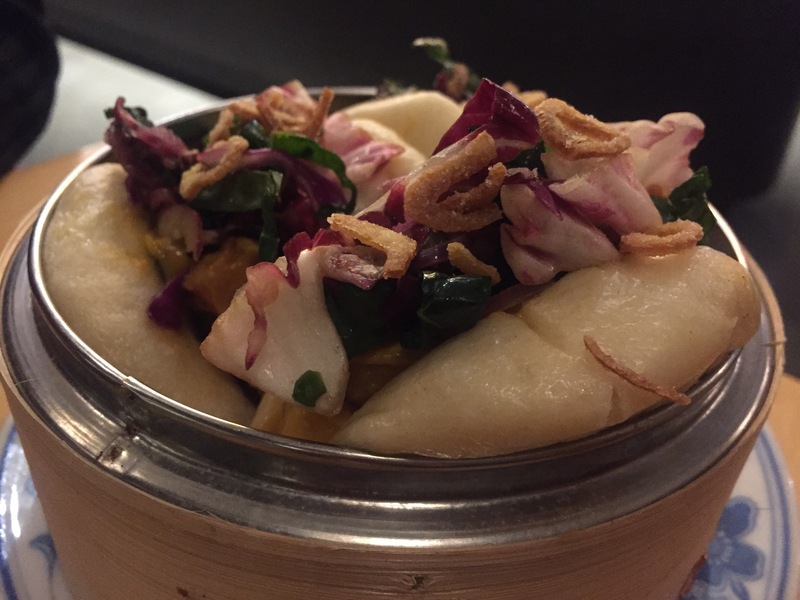 Staring off with their seasonal bun, squash, is a delightfully savory and sweet combination of several different cabbages and squashes with punpkin wrapped up in a rice bun with a rice vinegar sauce. But the main event with all its porky goodness is the draw. 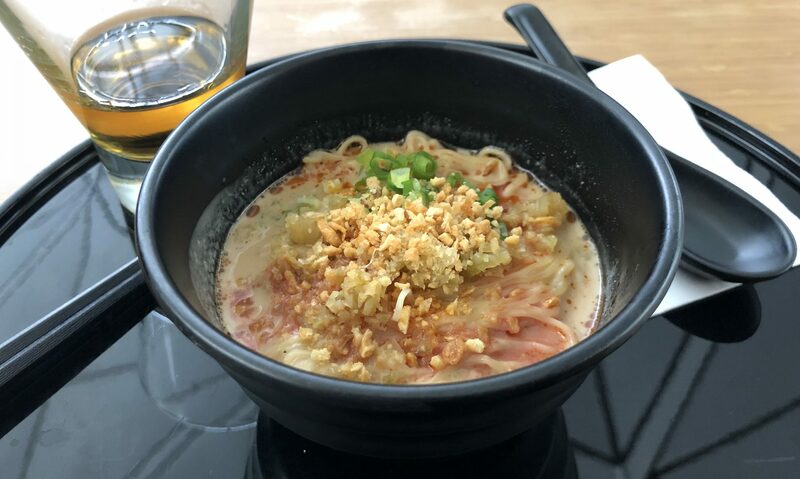 House-made al dente noodles fill a large bowl of a thin but umami-rich (beef?) broth with pulled pork. 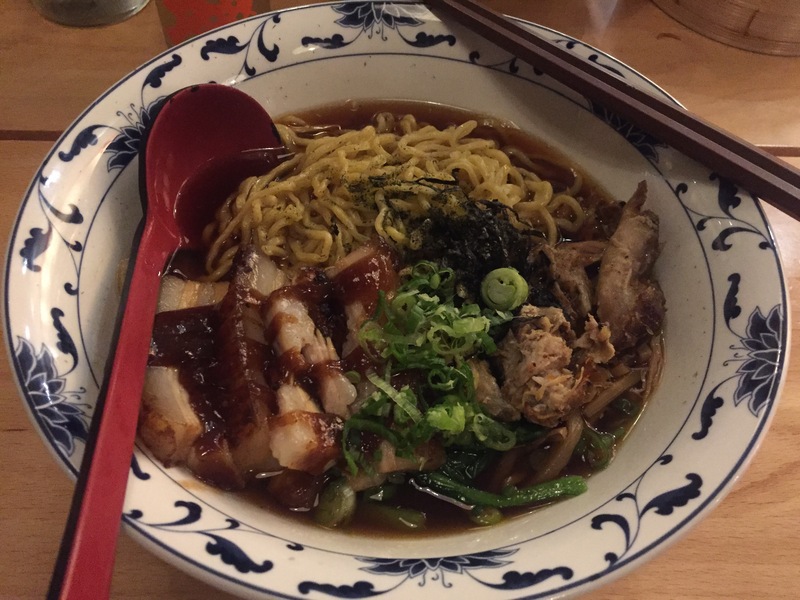 Top it off with some braised pork belly and bok choy, and you have a delicious savory soup for a cool night, even if it isn’t a traditional rich fatty ramen. Only downside? Closes at 9pm so get in early. 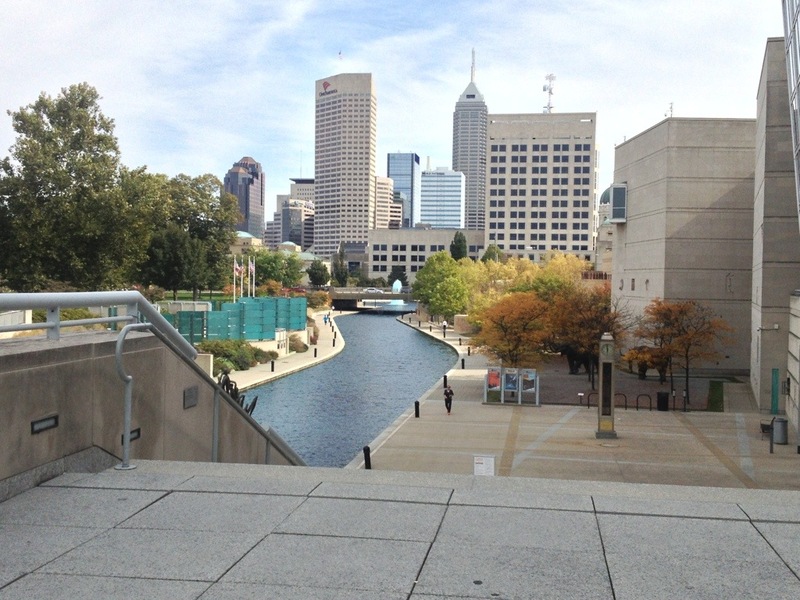 Day one on our own in Indiana, and we decided to wander around the museums and attractions in White River Park, an urban park and cultural area in downtown Indianapolis. First we hoped to try the LS Aryes Historic Tea Room, but that is only available for special events. So instead we tried the cafe in the Indiana State Museum, figuring museum cafes usually have decent choices. 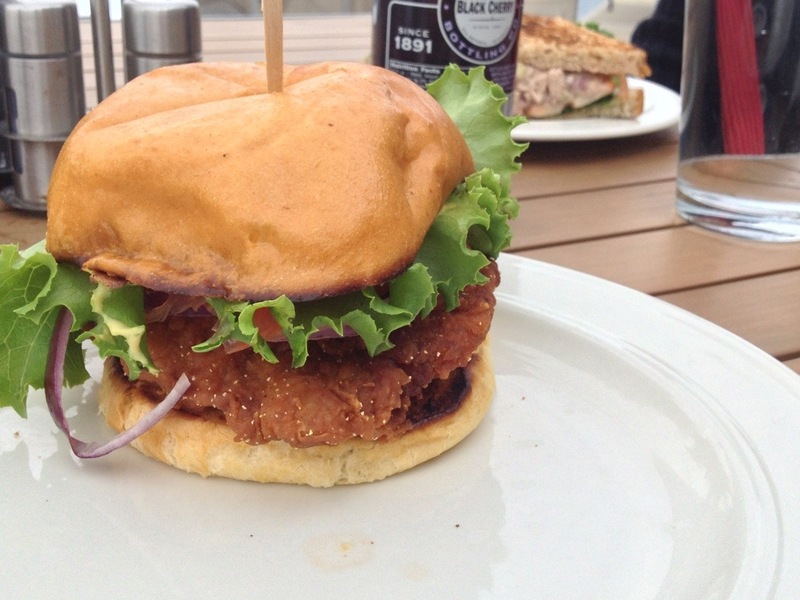 I selected the only thing that comes close to being a regional specialty, a fried pork tenderloin sandwich. This was delicious! The pork tenderloin was amazingly tender, literally falling apart at the touch. The breading was nice and crispy, holding the meat together. 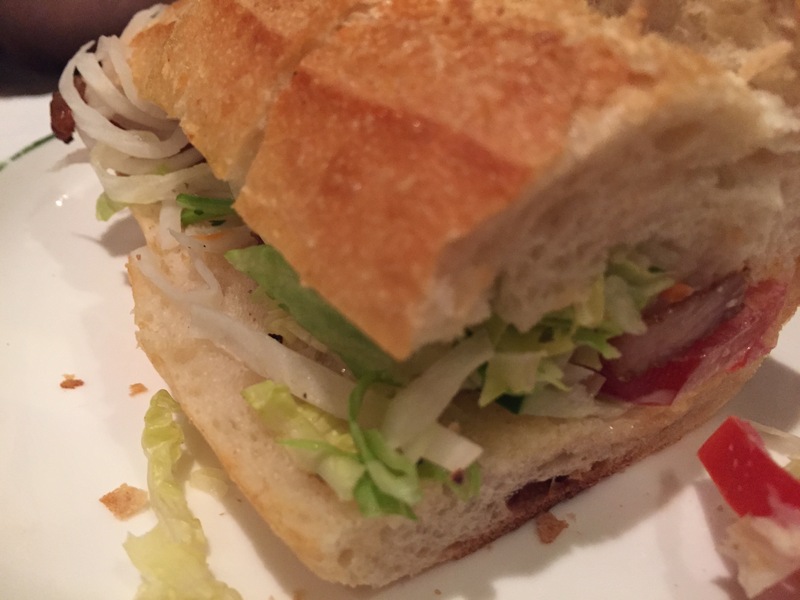 Topped with some lettuce, tomato, onions, and a spicy dijon mustard dressing, this was a well-constructed sandwich. My only complaint was that the crisp of the pork was a bit oily in flavor, but the texture was great. 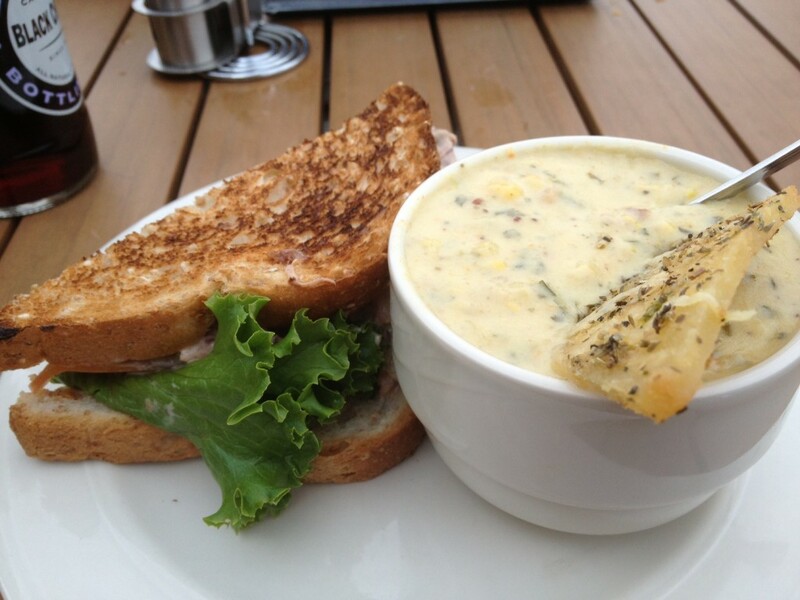 Pearl is a sucker for corn, bacon, and soup, so how could she pass up the bacon sweet corn chowder. Loaded with corn, potatoes, and bacon, this was a rich hot creamy dish. 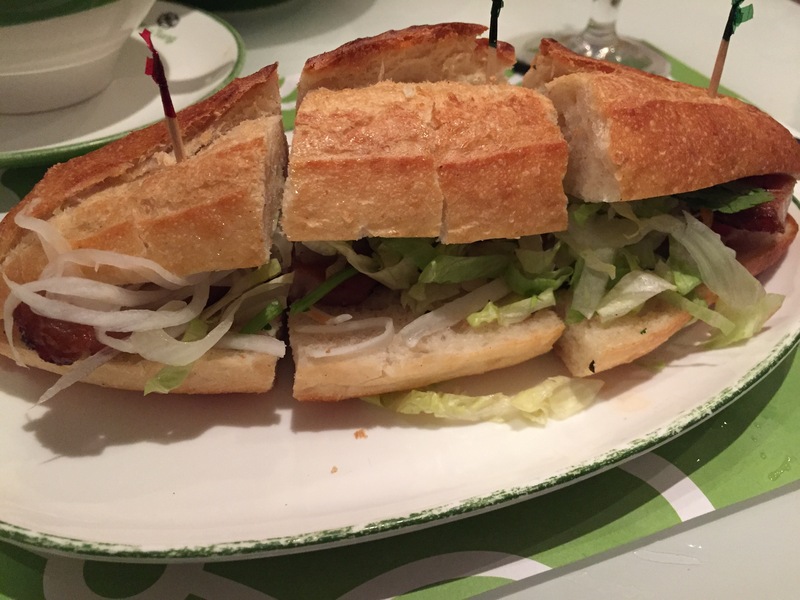 She paired the cup with a half-sandwich, a chicken salad sandwich so loaded that she needed to eat half of it with a spoon! The chicken salad was delicious, with flavorful chunked chicken instead of shredded. A surprising touch was the addition of cherries instead of the usual raisins. The result added a nice fresh tang to offset the creamy dressing. 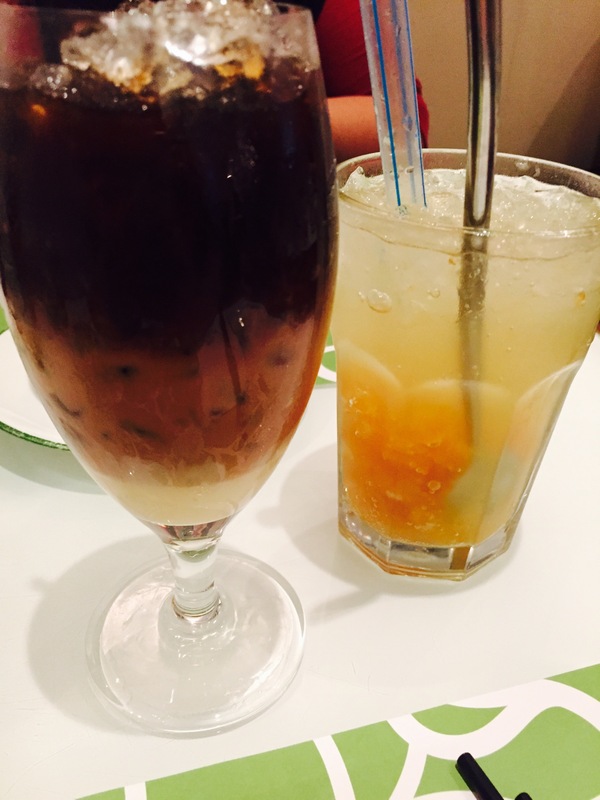 So, if visiting the museum area, check out the cafe. It’s a great option in an area with little else to choose from. Posted from Santa Barbara, California, United States. 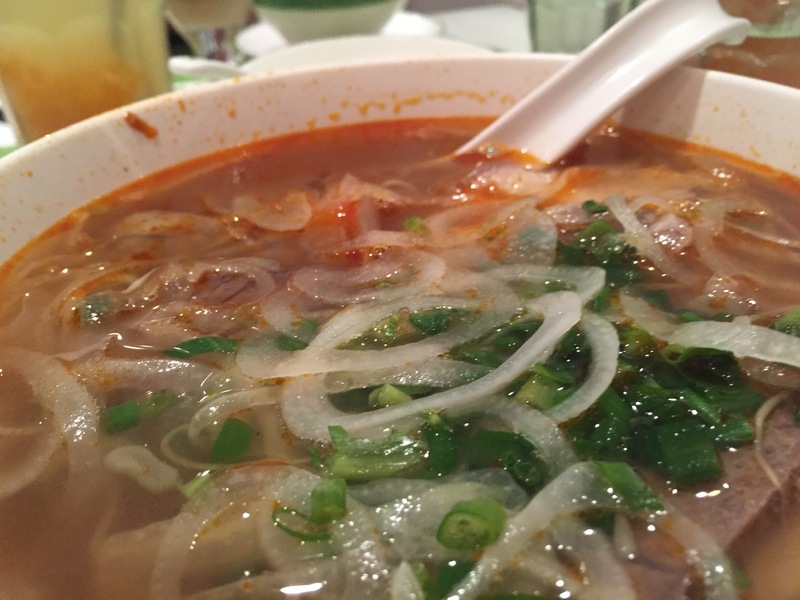 When we first planned to visit Santa Barbara for the weekend, we immediately began scoping out our dining options. 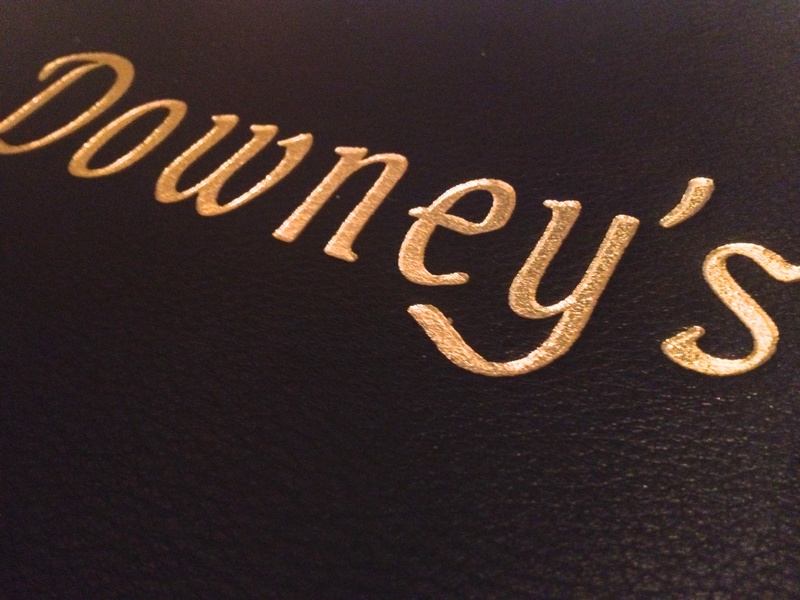 Downeys on State Street immediately floated to the top of our list, having been the number-one Zagat rated restaurant for 26 years in a row. Hard to argue with ratings like that. The interiors are simple California/French decor, very casual and simple, and the walls are liberally adorned with paintings by the chef’s wife, mostly of Central Coast beach landscapes. The dining room would benefit from the touch of a good interior designer, especially given the reputation of the restaurant, but everything was orderly and pleasant, just nothing special. 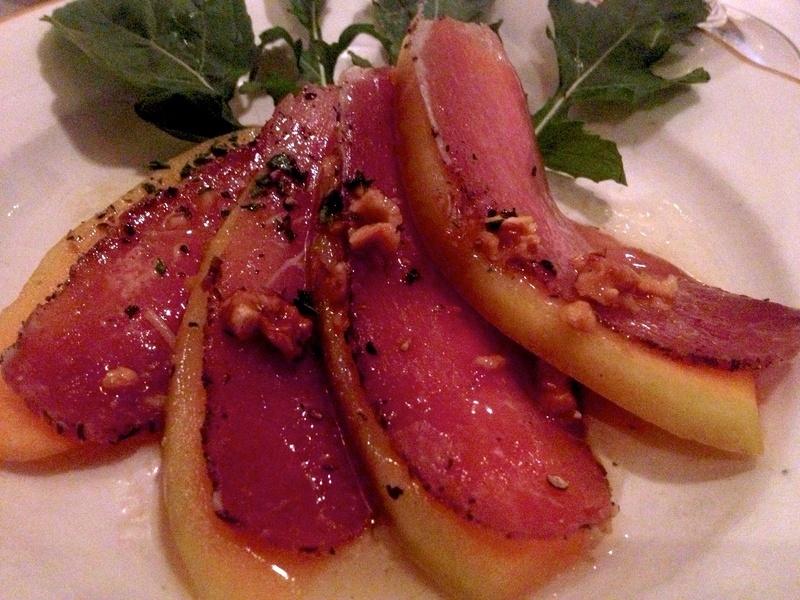 Downeys focuses on regional ingredients, and the menu changes nightly based on seasonal availability. With that in mind, I selected the duck entree which gets consistently great reviews, and my wife opted for the Taste of Santa Barbara pre fixe menu. My wife’s dinner started with fresh mussels on the half shell. 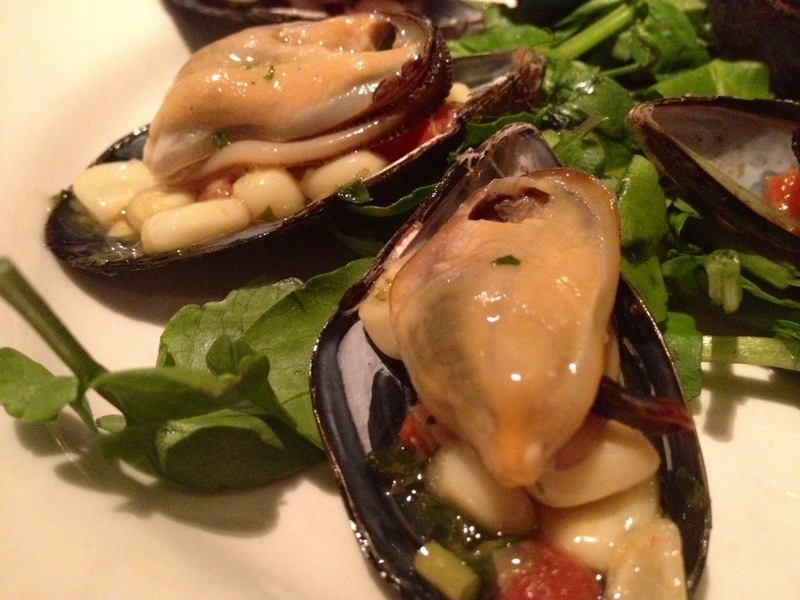 Plump and juicy, but the taste of the mussels was overpowered by the corn relish. Overall the flavors blended nicely with the natural bitterness of the watercress being replaced by a fresh crispness. While she enjoyed her mussels, I opted for the prosciutto with cantaloupe appetizer. There was a nice buttery nuttiness, but the meat was very bitter, and completely overpowered the cantaloupe. 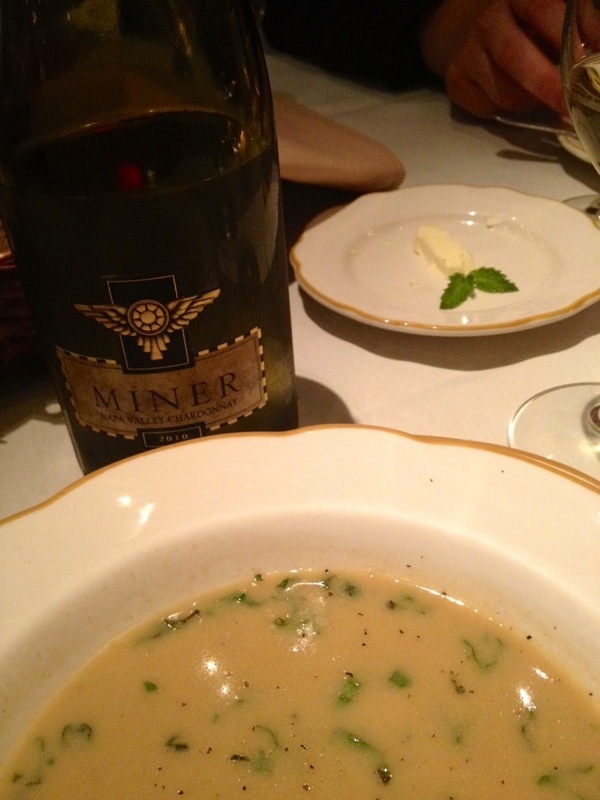 I was not a fan, but the dish did bring out some very pleasant flavors in our bottle of wine, a chardonnay from Miner Family. While the wine was nice with the prosciutto, it suffered and tasted acidic alongside the unannounced soup. We were expecting a salad according to the menu, but the corn soup was a welcome substitution as Pearl is always a big fan of corn soups. There was a plethora of fresh basil, and rich flavors and texture, but the sun-dried tomatoes added an acidity which a little bit of sugar could have helped offset. For her entre, Pearl had fresh-caught local sea bass. 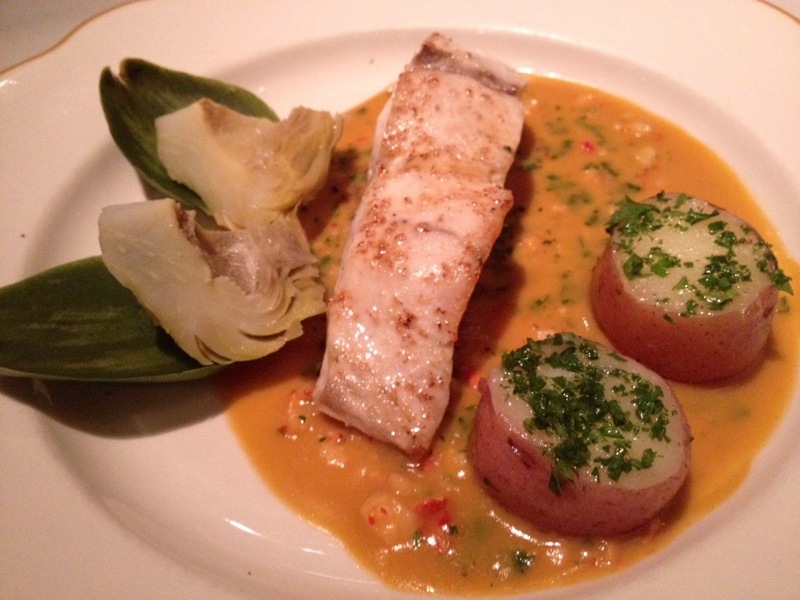 The lobster cream sauce was amazing, combining wonderfully with the fresh flavors of the fish. However, it was definitely overcooked, and the fish salty. If it had been cooked just slightly less, this could have been an almost perfect dish. I faired better with the duck. A nice crispy charred skin covered a rich textured interior. I don’t know how they did it, but this duck was not fatty at all, and the meat was tender and amazing flavorful. 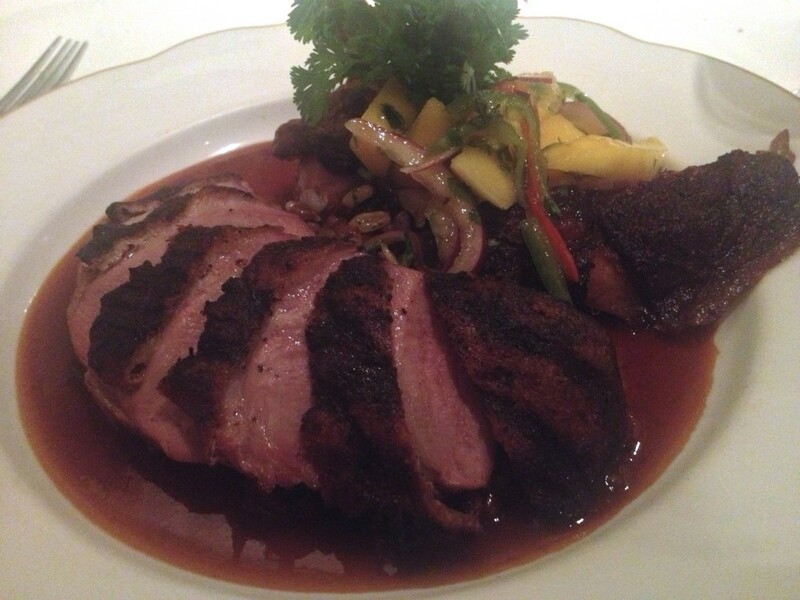 I kept being reminded of a good tri-tip as I thoroughly enjoyed this unusual duck presentation. Served over a bed of mixed grains in a wine reduction, the grains were a little on the al dente side but rich in flavor and texture variety. Also plated was some fresh mango which added a nice freshness to the dish as the fruity sweetness was masked by the wine sauce. Our wine selection didn’t stand up though. All flavor was completely stripped out when paired with the duck. I know I keep going on about the wine, but at its price and reputation, this restaurant should offer a good showing of local specialties. Supposedly the chef’s wife (aka the painter) also makes all the wine selections. When we described our taste preferences, the waitress narrowed down the extensive list to three recommendation. We selected one, and the waitress came back out a few minutes later to let us know the vintage they had on hand had changed, and that we probably wouldn’t care for the flavor profile based on what we described. This was exceptional service and knowledge which we really appreciated. She gave us a new recommendation, the Miner Family Chardonnay which we thoroughly enjoyed. This wine definitely is a pleasant drinking experience on its own, but failed to pair well with the majority of dishes in our dinner. 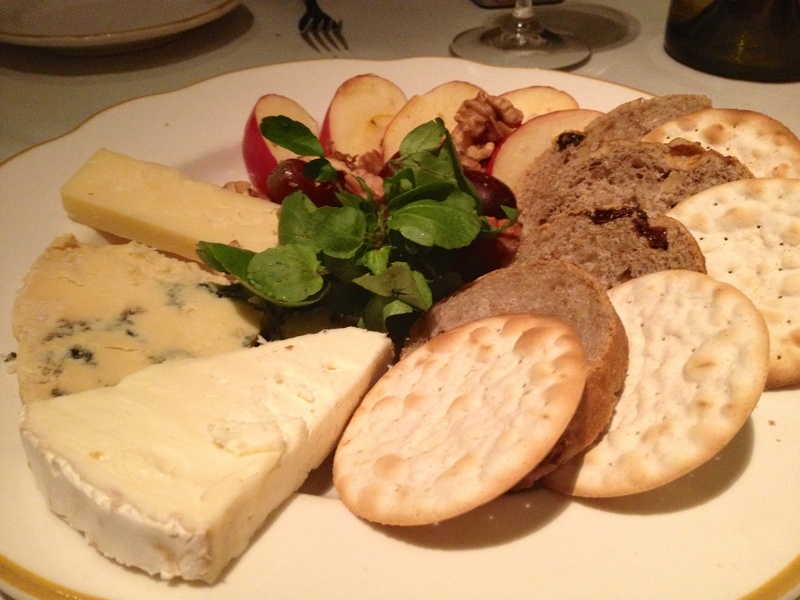 After the main courses, we had a cheese and fruit course, selecting three: St. Andres triple cream, Keens Cheddar, and a nice rich Stilton. All were fantastic, and the variety of flavors and interactions really let the wine make a good impression. 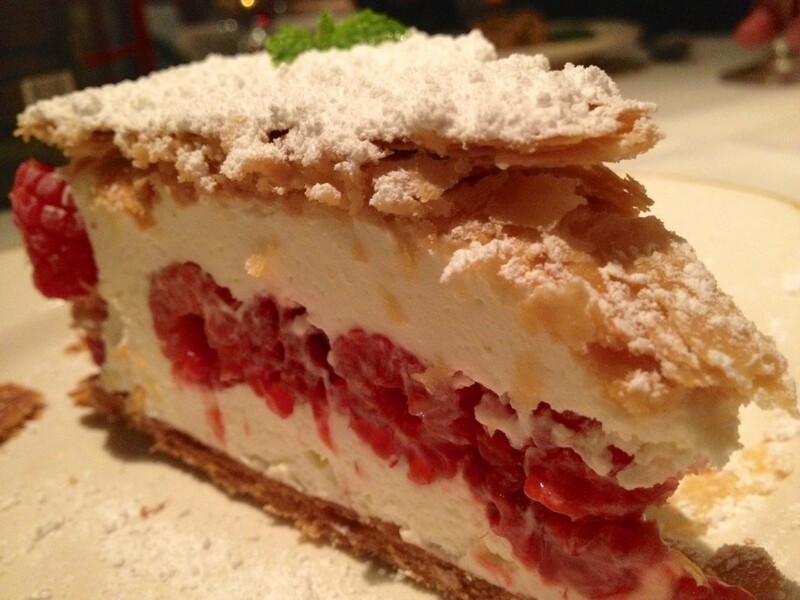 So for desert, Pearl went with the house specialty, fresh raspberries layered with a white chocolate whipped cream and sandwiched between two layers of flaky pastry. This was a beautiful dish, and I have no idea how they were able to cut it so perfectly without making a mess of the pastry. I elected the chocolate dish. This is what chocolate was meant to be, an amazing dense no-flour chocolate cake, with a rich dark chocolate ganache to cover, a dusting of hazelnuts, and an espresso creme anglaise. This is the richest, most exquisite chocolate I have ever had. 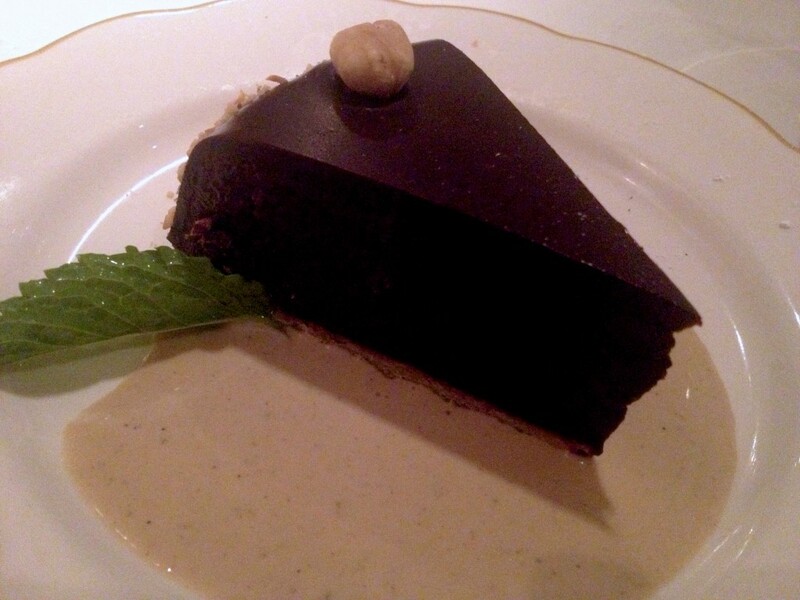 So delicious and fulfilling that I could barely touch the complementary truffles that came with the bill. Overall an expensive evening, but I think worth the price. 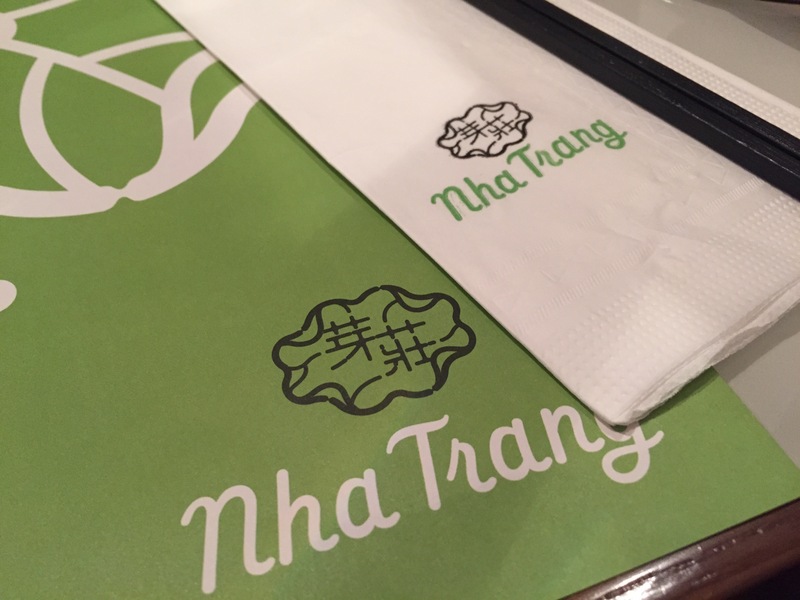 The waitstaff were knowledgeable, all very friendly and helpful, and the food flavors were really quite good, despite some minor preparation flaws.